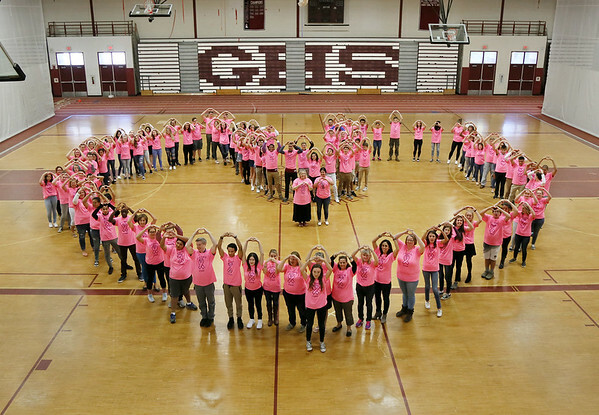 More than 100 pink-clad students and faculty form a giant heart in observance of Breast Cancer Awareness Month on Friday in the field house at Gloucester High School. In a yearly tradition that goes back more than a decade, money was raised through the sale of pink t-shirts. Over $700 was collected, after expenses, for donation to people struggling with cancer. The project was organized by language teachers Carol Finacey, a breast cancer survivor, and Rayanne Menery Sammataro. Another faculty member who has survived breast cancer, health teacher Rosa Francis, was part of the group.